Quesne’s works is based on a strong connection between space, set design and the actors on stage. In Caspar Western Friedrich, he combines the epic elements of the western film genre with the metaphysics of Romantic visual arts. Inspired by the image of the iconic lonesome cowboy as well as the paintings of the artist Caspar David Friedrich. Quesne focuses on the loneliness of the individual in both the western genre and Friedrich’s paintings, which are dominated by vast landscapes with the occasional lone figure standing with his back to the spectator or featuring so small in the painting to be almost insignificant. Four cowboys and a cowgirl (Peter Brombacher, Johan Leysen, Stefan Märki , Franz Rogowski and Julia Riedler) enter through a door in the safety curtain whilst credits of the production are rolling on the black background. After sitting down around a fake campfire with a few shrubs as decoration, they start singing songs such as “My Rifle, My Pony and Me” and “Whiskey, Leave Me Alone”, which Kirk Douglas sang in the classic 1952 western The Big Sky. Stefan Märki plays the accordion and others are strumming guitars. 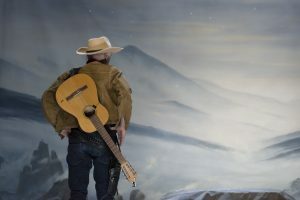 After Franz (Rogowski) puts on a hoodie featuring Caspar David Friedrich’s painting “Wanderer Above a Sea of Fog” that he received for his birthday, the safety curtain rises and the cowboys/ cowgirl get to work to fulfil their dream: a Caspar David Friedrich Museum in the West. Accompanied by classic film scores by Erich Wolfgang Korngold and Elmer Bernstein as well as the Clint Eastwood song “I Talk to the Trees” from the rather disastrous musical Paint My Wagon, the actors paint and redecorate the stage which is designed as a work shop. As they carry papier mâché rocks and boulders across the stage, climb on ladders, and balance paint brushes with extremely long handles, they sing songs and chat among themselves, or they stand with their backs to the audience whilst looking at projections of romantic aphorisms by Hölderlin, Rielke, or Novalis. Caspar Western Friedrich is not based on a literary text, the stories have developed out of the stage space and from improvisation during rehearsals. The stage itself is designed as a painting, anything relating to it is art and artificial. Quesne’s production is meant to be contemplative and tries to recapture the stillness of German Romanticism. There is no linear action, the audience is supposed to look at a landscape and to experience a view to the far horizons. As a vast canvas is unfurled, a variation on Caspar David Friedrich’s painting “Wanderer Above a Sea of Fog” is revealed – a landscape without the wanderer – thereby inviting everybody to “be” the wanderer in the painting. As the actors take selfies and tell stories about their travels, this work of art is cheapened and destroyed, leading to a vast loneliness.